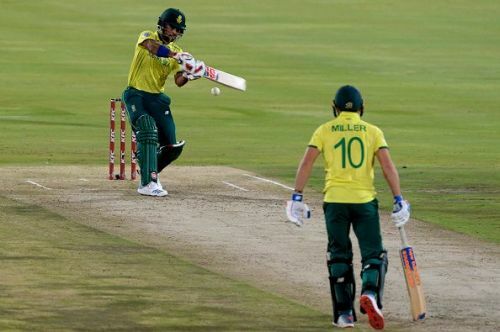 South Africa defeated Sri Lanka by 16 runs in a high-scoring thriller played at SuperSport Park, Centurion on Friday. Thanks to Hendricks, Van der Dussen and JP Duminy's knocks, the hosts posted a competitive total and won the match with ease despite Isuru Udana's brilliance at the end. Sri Lankan captain Lasith Malinga won the toss and decided to field first. Udana got the early breakthrough, dismissing Aiden Markram for 3 runs. At the end of 6 overs, South Africa had managed just 39 runs for the loss of a wicket. Van der Dussen and Reeza Hendricks then took the attack to the Sri Lankan bowlers. Hendricks reached his fifty off 38 balls while van der Dussen completed his 50 off 34 balls. It was an amazing display of hitting by both batsmen. However, Malinga struck to dismiss the dangerous Hendricks for 65, breaking the partnership which had reached 116 runs. JP Duminy then came to the crease and played a quickfire cameo, scoring 33 off 17 balls while Miller scored just 9 off 9 balls. Duminy smashed Thisara Perera all over the park to help South Africa post 180 for 3 in 20 overs. Chasing the target of 181 runs to win, Sri Lanka got off to the worst possible start, losing 2 early wickets of Avishka Fernando and Kusal Mendis in the very first over. Thisara Perera and Dickwella added 26 runs for the 3rd wicket. At the end of 6 overs, Sri Lanka were 47 for 4. They kept losing wickets at regular intervals though and were reduced to 83 for 7. Udana then provided Sri Lanka with some hope as he smashed the South African bowlers all over the park. Udana reached his fifty off 33 balls but was keen on taking his side through. Udana and Dhanajaya added 46 runs for the 8th wicket. Udana tried his best to help Sri Lanka win the match, but it was a tough ask for him. He remained not out on 84 off 48 balls even as the visitors ended their innings at 164 for 8 in 20 overs.